At a time when society is plunging into a digital revolution, we need to improve living conditions for middle-class Americans, Vice President Joe Biden told a capacity crowd of 5,000 in Sanford Field House. 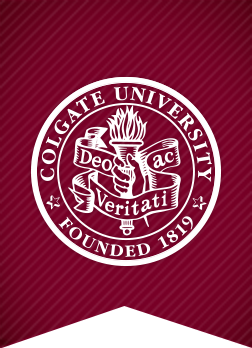 The March 24 event was part of the Kerschner Family Series Global Leaders at Colgate. “We’re already seeing how digital advances are not only impressive but are also consequential and disruptive for all our economies,” he said. According to Biden, digital innovation is deleting jobs in sectors across the economy, leaving dual-income families in unprecedented financial straits. 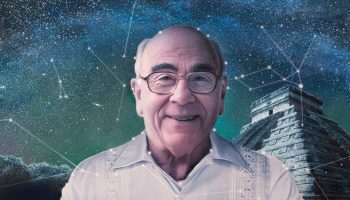 Drawing on 45 years of public policy experience, he outlined five steps that he believes will turn the digital revolution to the advantage of working-class Americans. They include basic protection for workers, modernization of infrastructure, a more progressive tax code, expanded access to capital, and increased access to affordable education. “Corporations and civil society will have to make some changes as well,” Biden noted. When Casey asked Biden if he regretted not running for president, Biden admitted that he wished he had been elected, but didn’t second-guess his decision not to run — borne of his need to focus on his son Beau, who, at the time, had developed the brain tumor that would ultimately take his life. Biden then switched between pol and preacher, prompted by questions that urged him to explain how America arrived at a Trump presidency and how the nation should move forward. “We made a mistake in not paying attention to traditional Democrats who have lost hope,” Biden admitted. 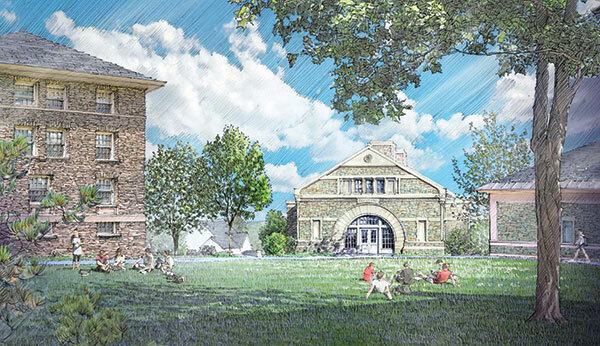 This spring, Colgate launched two new construction projects designed by Robert A.M. Stern Architects: Benton Hall, the future home of a center for comprehensive career development and a pair of residence halls geared to fuel collaboration and social connections. Both are planned to meet LEED Silver sustainability standards. Nestled just below McGregory and Olin halls, with welcoming entrances from both the Academic Quad and Oak Drive, Benton Hall will house the Center for Career Services and the Office of National Fellowships and Scholarships. Named for Colgate Trustee Daniel C. Benton ’80, P’10, H’10, the hall takes design cues from several classic campus buildings, including Hascall and James C. Colgate halls. Fronted by a gracious reception area, the space will offer interview suites, a flexible career commons for large meetings and lectures, and spaces for one-on-one career advising. 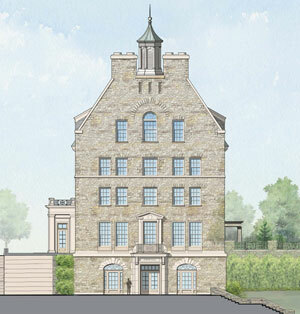 Rising behind Stillman and Andrews halls on the upper campus, and constructed of native stone, the as-yet-unnamed halls will add an outdoor quadrangle to the campus, and their exteriors will reflect Colgate’s historic architectural vernacular. Each 100-bed facility will feature three upper floors with double rooms, four-resident suites, and study lounges. To support intellectual inquiry and community building, the first floors and ground levels will feature seminar rooms, classrooms, offices, and social lounges. Meanwhile, several other residence halls will be reconfigured and renovated to offer these same benefits to students. 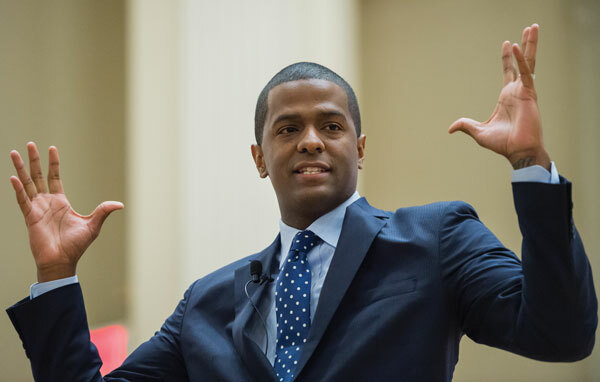 A politician, attorney, and rising Democratic influencer, Sellers explored the pursuit of equality and justice in America — from King’s fight to today’s battles. Sellers delivered his speech, “Education, Civil Rights, and Equality: Cornerstones of Our Future,” with humor and honesty. “Kids literally go to school today where they are punished because of the zip code that they’re born into … where their infrastructure is falling apart, where their heating and air don’t work, where their teachers are often overworked and underpaid,” he said. How far have we really come, he asked, when people in our communities fight to escape poverty without any structural support, just as “the proverbial dog chases its tail.” Sellers challenged the audience to think about the ways that education intersects with race and the criminal justice system to continue inequality in America. There’s been progress, but Americans “have a ways to go,” said Sellers. He advised people to “dream with our eyes open” to create change. For Sellers, that meant running for the South Carolina state legislature when he was just 22 years old and working within the political system to inspire change. For students, that could mean calling state representatives or speaking honestly with someone who holds different opinions than they do. “Our challenge, as change agents in this country, is to go in and shatter these systems that are broken,” Sellers said. “That’s what Dr. King was trying to do. Colgate’s celebration of Martin Luther King Jr. Week began January 23 with a vocal performance by Jazmyn McKoy ’17 and a student keynote, “Remembering Ourselves,” by Ashleandra Opoku ’17. 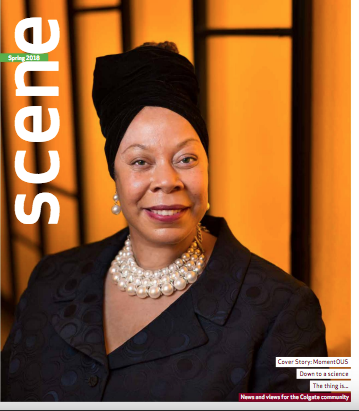 Other events included discussions on topics ranging from black feminism to King’s legacy in the new presidential era. The week concluded with a day of service in which students got involved on campus and in the local community, which was coordinated by the Max A. Shacknai Center for Outreach, Volunteerism, and Education. 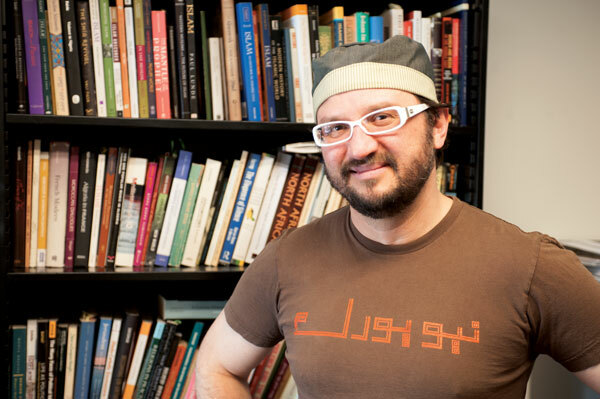 Associate Professor Emilio Spadola bought this shirt, featuring “New York” written in Arabic, when he was living in New York City and earning his graduate degrees at Columbia University back in 2002. Today, he’s teaching anthropology and Islamic Studies while he serves as director of Colgate’s Middle Eastern and Islamic Studies Program; the shirt still has a place in his wardrobe. 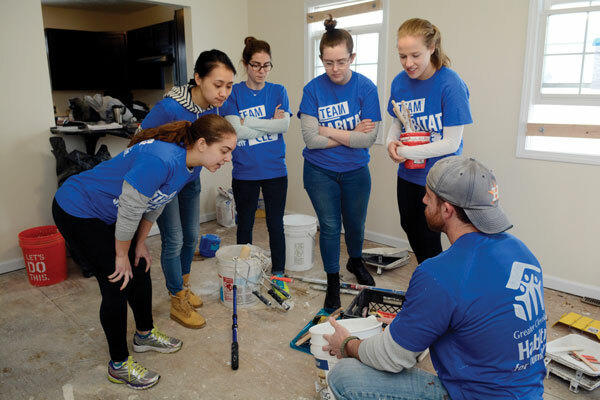 In mid-March, eight students and Colgate staffer Lindsey Hoham piled into a van and headed west for Cleveland, Ohio, to pitch in for Habitat for Humanity. During the week, they worked at two houses and a Habitat ReStore (home improvement store and donation center). Although the houses they worked on hadn’t yet been assigned to families, the group did have the chance to meet other Habitat for Humanity families during an arts and crafts event. 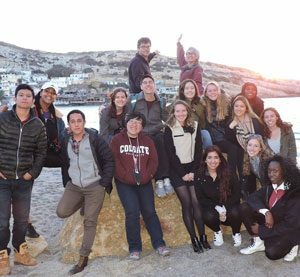 The trip was coordinated by Colgate’s Max A. Shacknai Center for Outreach, Volunteerism, and Education (COVE). Other alternative spring break trips took students to New York City, West Virginia, and Georgia — organized through the COVE and the Office of the Chaplains. Lisa Heller ’18 has reached out to the world through her music, and the world is reaching back. Her single “Hope” has drawn more than 1.5 million views on YouTube, trending to number one in five countries, at press time. Through her song, its video, and the accompanying campaign, she’s touched people around the world. 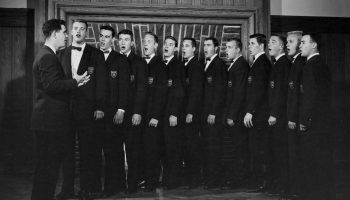 Heller found her love for singing through a series of unexpected events during her sophomore year of high school. “I was in the middle of running a race and my throat started closing up,” she said. “I wasn’t sure what was happening, but I just couldn’t get the air in.” Heller ended up collapsing over the finish line. 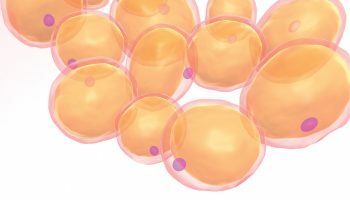 A few months later, she was diagnosed with vocal cord dysfunction. Her doctor advised her to relax her vocal cords by singing or humming during her races. Around the same time, Heller taught herself how to play the piano when a Steinway was passed down in her family. “I wrote my first song and, after that, I became addicted to it and I couldn’t stop writing,” she said. She wrote “Hope” in January of 2016, recorded it in Los Angeles, and taped the video in May. “I wanted to make it universal enough that anyone could relate to it,” Heller said of the song that has an all-embracing message of inspiration. She took “Hope” to children with terminal illnesses in her community, playing the song at hospitals and homes. As her music video attracted more views, her message spread farther, too. “People from around the world started to reach out to me,” she said. The response motivated her to create the Hope Wall, an online forum where people can talk about their illnesses as well as the dreams that push them to persevere. At Colgate, Heller is a psychology major, following in the footsteps of her mom, Wendy (Loeb) Heller ’88. Lisa is also the event director for the Student Committee on Providing Entertainment, on the Colgate Activities Board’s music committee, and in Kappa Kappa Gamma. Hoping to make music her career, she has recently released a new song, called “Things You Never Said”; has another video coming out soon; and is continuing to write more. Check out her music and latest releases here. High energy, love, and delight” filled Memorial Chapel during Gospel Fest on February 17, said Paul Jackson ’18, a president of Sojourners Gospel Choir. Jazmyn McKoy ’17 kicked off the event with two solos: “Keep the Dream Alive” and “Lift Every Voice and Sing” in arrangements by local musician Dianne McDowell. 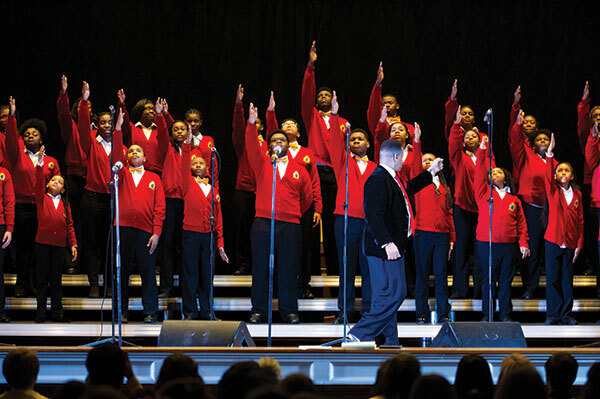 Next, Walt Whitman’s Soul Children of Chicago performed. “[They] are like family now,” said McKoy, who has sung with them at three previous Gospel Fest events. The show closed with the two ensembles joining together on the Sister Sledge classic “We Are Family.” The children’s choir danced their way into the audience of more than 400 people, who clapped and sang along. As students headed into spring break in March, we asked: What are your plans? — Derek Baker ’18, a French major from Buffalo, N.Y.
— Megan Carney ’18, a geography major from Yorktown, N.Y.
— Jenny Lundt ’19, a peace and conflict studies major from Santa Barbara, Calif.
Escaping snowy Hamilton for a week in January, four Sophomore Residential Seminar (SRS) classes traveled abroad to either London, Crete, India, or Paris. 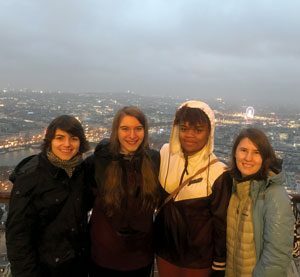 Sophomores accepted into the third-annual SRS program spent last fall living and learning together before going overseas to connect the classroom with world culture. 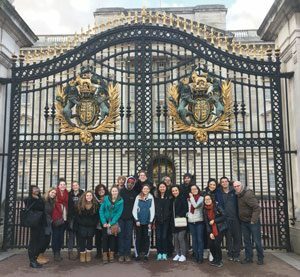 As a member of Professor David McCabe’s SRS trip to London, I spent a week exploring the city’s abundant history and living in a flat just two blocks from the British Museum. 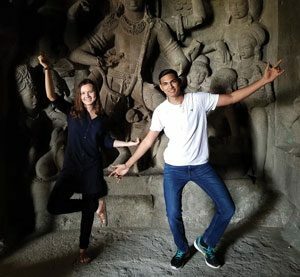 Enamored with my own experience, I connected with other SRS students to hear their travel tales. London’s history as the birthplace of industrialization makes it a fitting location for a foray into the implications of “modernity.” By reading the works of Karl Marx, Sigmund Freud, and Virginia Woolf, students gained insight into the late 19th-century changes to morality, sexuality, identity, and religion. Nietzsche, Camus, and Sartre, oh my! PHIL 216 was an introduction to the 19th- and 20th-century philosophy of existentialism, particularly through the lens of the Parisian existentialist couple Jean-Paul Sartre and Simone de Beauvoir. Crete earned its fame as the site of a number of iconic myths, including the battle between Theseus and the Minotaur, and the births of the immortal Zeus and Hera. 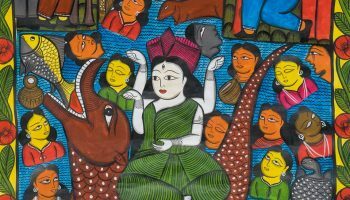 While these stories may be ancient history, this classics course made it clear that the legacy of these “imaginary pasts” continues to shape the culture and identity of the land. To prepare for their trip to western India, students researched a Buddhist stupa, an early mosque, or a Hindu temple that they would later visit. Their research, as well as photos and testimonials about their travels, can be found here.